Polystyrene is a hard and solid plastic, which is produced through the polymerization of styrene. It is a vinyl polymer, with a long hydrocarbon chain structure, wherein a phenyl group is attached to every other carbon atom. Polystyrene is a versatile plastic that is mainly utilized in refrigerators, air conditioners, instrument panels, televisions, computers, and disposable utensils (such as foamed cups, plates, and bowls). It is also used to develop consumer products, such as CD and DVD cases and food packaging materials. It is an inexpensive and strong plastic that can be used to insulate buildings, create sterile disposable cutlery, and can also be recycled into domestic building products. The global polystyrene market is projected to reach USD 28.2 Billion by 2019, at a CAGR of 5.1% between 2014 and 2019. The growth is mainly attributed to the increasing rates of industrialization and globalization across the globe. This is also expected to give impetus to the global demand for market in packaging and electronics applications. China is anticipated to be the largest market for polystyrene, followed by other emerging economies in the Asia-Pacific region. Asia-Pacific is the most dominant region in the market owing to increasing plastic consumption and rapid urbanization in this region. Packaging and electronics are estimated to be the two largest application segments of the market in 2014. These segments are projected to grow at the highest CAGR in global market between 2014 and 2019. High penetration of polystyrene in the electronics and appliances industry is anticipated to fuel the growth of the global polystyrene market. This report estimates the market for 2014, and projects its expected market size till 2019. It also provides a detailed qualitative and quantitative analysis of the market. Various secondary sources, such as encyclopedia, directories, and databases are used to identify and collect information useful for this extensive commercial study. The primary sources comprise interviews of suppliers and experts from related industries, to obtain and verify critical information as well as to assess the future prospects of the market. Competitive scenario of top players in the market has been discussed in detail, along with their recent developments and other growth strategies. Leading players profiled in this report include BASF SE (Germany), Styrosolution Group (Germany), Videolar S/A. (Sao Paulo), SABIC (Saudi Arabia), and Formosa Plastic Corporation (Taiwan) among others. This research report categorizes the global polystyrene market on the basis of application and region. On the basis of application: By application, the market is segmented into packaging, electronics, consumer goods & appliances, and construction among others. Each application is further described in detail in the report with volume and value forecasts. The polystyrene market is expected to reach USD 28.2 Billion by 2019, at a CAGR of 5.1% from 2014 to 2019. Polystyrene is a hard and inexpensive polymer found in objects of day-to-day use. It is mainly utilized in the production of model cars, airplanes, and foams among others. Polystyrene is marginally biodegradable, and is often found in abundance as a form of litter in the outdoor environment, particularly along shores and waterways. The report covers the polystyrene market, and is segmented into varied applications, such as packaging, electronics, consumer goods & appliances, and construction among others. The packaging application is the most dominant application of polystyrene, followed by electronics and consumer goods & appliances. The packaging application accounted for a share of 37.6% in 2014. Similarly, the electronics application of the market is projected to grow at the highest CAGR of 5.9% between 2014 and 2019. On the basis of region, the market is classified into Asia-Pacific, Europe, North America, and South America & MEA. The market has further been analyzed with respect to sixteen major countries, which include China, Japan, Korea, Taiwan, Australia, Germany, Italy, France, the U.K., the Netherlands, U.S., Canada, Mexico, Brazil, Saudi Arabia, and Argentina. These countries have been selected based on the existing market of polystyrene and their growth potential. Some of the most prominent companies in the market include Styrolution Group GMBH (Germany), Total Petrochemicals (Houston), BASF SE (Germany), Formosa Chemicals & Fiber Corporation (Taiwan), Kumho Petrochemicals Ltd. (South Korea), Chi Mei Corporation (Taiwan), SABIC (Saudi Arabia), Trinseo (U.S.), Videolar S/A (Brazil), and The Dow Chemical Company (U.S.). 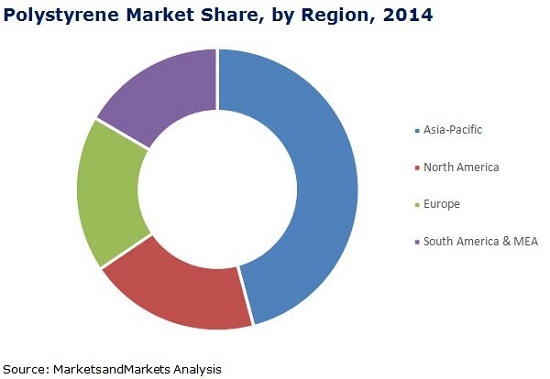 Asia-Pacific is projected to continue to lead the polystyrene market till 2019, followed by North America and Europe. Asia-Pacific and South America & MEA are the fastest-growing regions in the market. Asia-Pacific has its major demand and supply of polystyrene concentrated in the north-eastern region, with China being the largest producer and consumer of polystyrene, followed by Japan, Korea, and Australia.